I’ve had this big, bold scarf design in mind for a while, but something about my design idea wasn’t quite right. 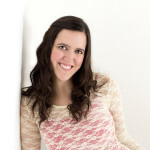 Then last week I learned a new skill – the crochet I-Cord! I immediately knew I HAD to bring this pattern to life….ASAP! It was clear to me right away that the gorgeous Red Heart Irresistible yarn I had sitting on my shelf was the perfect option for this pattern. I’ve been working on my projects for the Jennika Mystery Create-A-Long for a few months now (the sign ups are happening this week!! I’m SO excited. Get a sneak peek by clicking here if you haven’t already) so a fun, quick project like this one was a perfect little side adventure for me. 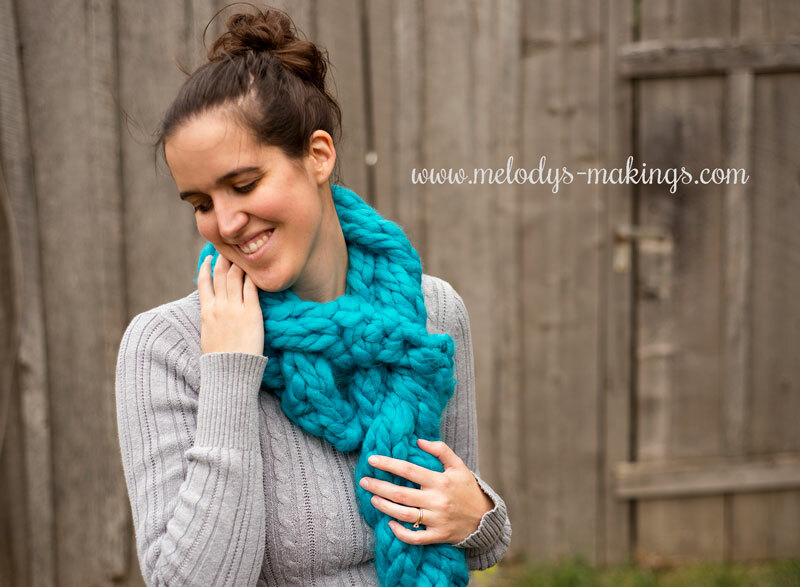 This bold, trendy braided scarf is sure to be a hit this Christmas….and it takes only one hour (or less!) to make. 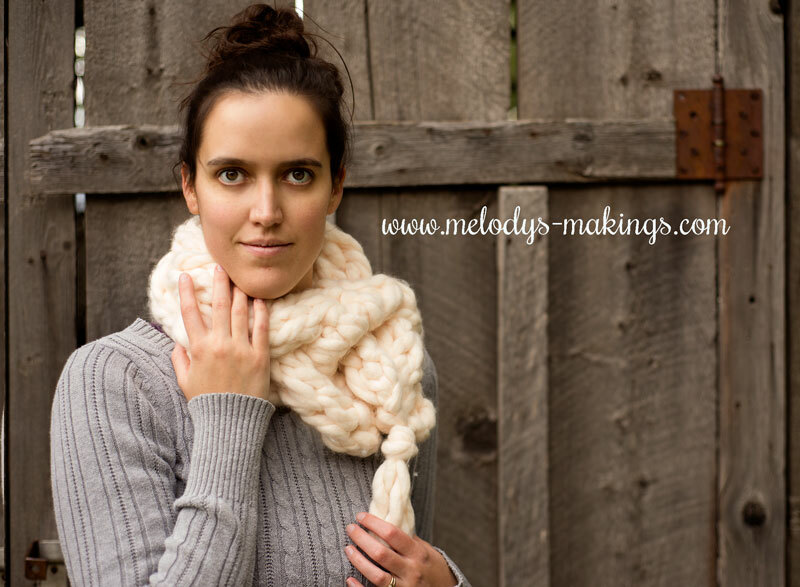 I’ve created both a knit and a crochet version of this free scarf pattern…and they’re nearly identical! 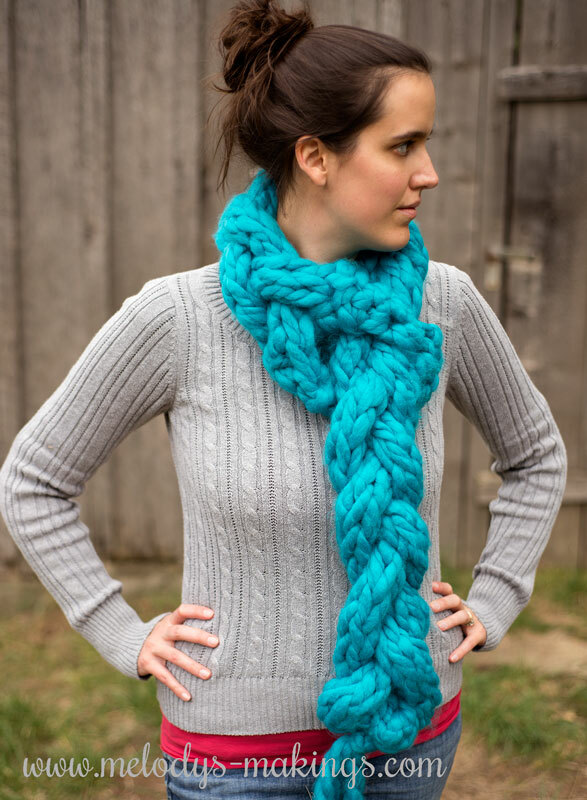 I’ve also included instructions for either a cowl style scarf or the longer braided scarf you see in blue. If you’re a knitter, all you need to know is how to create a 3 stitch I-Cord. If you’re a crocheter, then enjoy the video below which will walk you through this project step by step. I’ve also included a crochet I-Cord video I recently posted on my Facebook page. Hope you find it helpful! Click here to watch on YouTube. Click here to watch on YouTube. 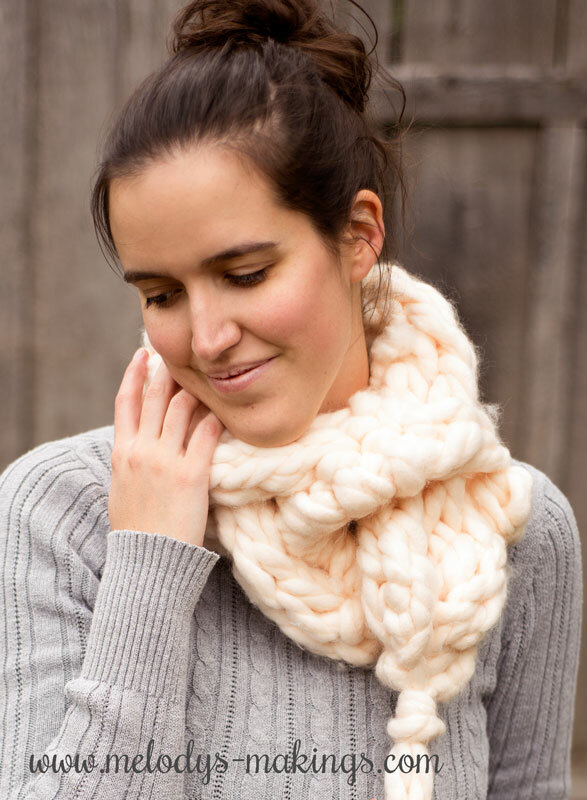 Love this bulky knit scarf!! I am excited to try this scarf. You always have such unique things to crochet! Thanks. In the knit version instructions, it says K = Chain (which obviously should mean Knit)… The patterns are lovely, and the scarves look so warm and cuddly. I can’t wait to find some super big yarn to make a few of these for gifts going into winter! Thank you for sharing them. Thank you! I’ll get that corrected 🙂 Glad you like the pattern! I believe it should be 4 stitches at end of row 1. This is so unusual and so lovely at the same time. Love it! !